Members of the Russian militia, the equivalent of the police forces in north America, are using the Internet to fight corruption within their own ranks. The reaction of the institution is the classical one, dismissal, and in some cases false accusations followed by imprisonment. This demonstrates that the higher ranks of the Russian militia don't know how to deal effectively with the "multitude" social phenomena, which is good news. They don't seam to understand that their actions of reprisal will inevitably turn back to bite them, now in the age of the free and democratic media. Moreover, they also need to realize that these good militia man and woman can coordinate their efforts using the same digital technology and the Internet, and rally the support of the people, who already despise militia arrogance and corruption. See the case of officer Alexey Alexandrovich Dymovsky. A tyrannical government applies the new information technology in a way which is dictated by its own condition. Because it is bound to adopt a centralized and hierarchical organizational structure, and because the goal is to maintain control, the tyrannical government is unable to actualize the full potential of this generative technology. Tyrannical governments are constantly trying to improve their situation, and they are exploring the potential of the new emerging technology. However, it is important to understand that the way they look at it is profoundly affected by their condition. They are materially obliged to adopt a hierarchical form of organization, and this fundamental constraint creates in turn the paradigm which governs their vision and their interpretation for the new technology. Consequently, the solutions proposed so far, in general, are not generative. They don't posses the multiplication property by which their effect grows exponentially, simply because potential must be contained within a hierarchical structure of power. Overall, governments are interested in rapid and accurate access to personal information, analysis of personal information on a large scale to extract trends and patterns, increased control over individual potential and material possibilities of success, increased communication and coordination capabilities between the instruments of power, better forecasting and planning, increased efficiency in controlling masses by force, etc. Some of these tools are becoming very effective, but more vulnerable, because most of these systems are centralized. The future will be determined by the race between the tyrants and the multitude, by how much potential each side can actualize from the new technology. My bet is on the multitude. By sheer number and counting on the creative power of the connected multitude, we have the potential to explore all possible applications of the new technology and to extract all the benefits for ourselves. Moreover, the new technology seams to be better suited to connect individuals and to sum their collective efforts then to divide and to control. Where is the Internet going? It must stay open, neutral! Up to 3,500 U.S. army troops have been ordered to leave for Haiti, said U.S. Department of Defense on Thursday.The US army took control of the main airport in Port-au-Prince immediately after the disaster. The U.S. Navy aircraft carrier USS Carl Vinson is due to arrive Thursday, carrying 14 helicopters. While the report did not provide any troop figures, Southern Command commander Gen. Douglas Fraser said Wednesday the U.S. was also deploying a large amphibious ship carrying a 2,000-person Marine expeditionary unit, helicopters and smaller landing craft. That unit is set to arrive Friday (see report 1; see report 2). Canada sent 200 troops, and police forces are also sent for "help" (see report). Brazil has already 1,266 military in Haiti, who are part of the United Nations peacekeeping force (Minustah), and is sending more (see report). Is the army really necessary to help Haiti, or perhaps this is an effort to maintain control over this country, where the puppet government is out of order due to the disaster? I'am not trying to minimize the human suffering caused by the earthquake. I'am not saying that other countries should not help in any way they can. But is there really a need for such a massive deployment of troops and military equipment. 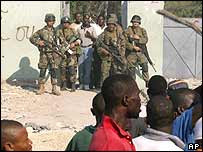 Under the veil of the humanitarian aid this is a military invasion of Haiti. Canada, along with the United States and France, has targeted this poorest of nations in the Western Hemisphere for special assistance. Haiti is Canada's second-largest aid recipient after Afghanistan. See report. Remember that the US and France, helped by Canada, plotted the coup d'Etat against Jean-Bertrand Aristide. Aristide was kidnapped in the middle of the night of 28 February 2004, and transported to a French military base in Africa. In 2000 Aristide published a book, The Eyes of the Heart: Seeking a Path for the Poor in the Age of Globalization, which used Haiti as a case study of globalization. Aristide specifically points out problems with the World Bank and the IMF in creating larger problems within Haitian society and the economy. Viral Labeling was proposed by the Multitude Project in 2009. It is a boycott method that successfully combines online (virtual) and real life (labeling) activities.This method forces the distributor of boycotted products into the action, and directly helps the competition of the boycotted company. A small budget movie made by some young Canadian guys, explaining the Canadian financial system and the power structure in Canada. This video will move a lot of young people. Excellent use of the new technology! Tiberius Brastaviceanu proposes the Scientific Oeuvre to replace the current system of science communication. "Sharing and collaboration, as well as free access to all scientific knowledge are values that make the ethical framework of this article. I strongly believe that these values have positive consequences in terms of economics (in the general sense of the word) within a strongly interconnected society, but I leave the argumentation for another day. My point is that in the context of our modern society, the solution to the information crisis seems to be aligned with these values, which, in turn, engender positive outcomes in terms of production of new knowledge, and its embodiment into new technologies. " Large companies, especially large conglomerates, are starting to use web-based social networking tools for employees. These tools will certainly improve communication within the organization, and will help solidify its internal culture. Moreover, cross disciplinary communication and collaboration, which will be facilitated by these tools, will also increase the creativity and the efficiency of the organization. There is one major shortcoming, these social networks are usually closed, they are only accessible to employees. These new measures are the living proof that corporate managers are recognizing the need to manage the organization not as a machine, the command and control paradigm, but more as a community. Cool, the human factor is slowly coming back into the picture... It took them quite some time to realize that an individual needs more than just material gratification; that if you treat a human being as a replaceable and disposable piece of equipment, a "human resource", you will not get his/her full cooperation, and you will not benefit from his/her creativity. It is also about time for them to re-realize that groups are not merely clusters of individuals, and to give them the freedom to organize and to collaborate is far more advantageous than to divide them to better control them. These big corporations are too late in trying to use the new technology to better their business. But their fundamental problem is not even there. It is their structure. They are hierarchical, closed structures. Please visit our Economical alternatives section to understand why open organic networks are economically far more superior to closed hierarchies, in the context of a knowledge-based economy. BALTIMORE (AP) — Lockheed Martin Corp. is setting up a private social network for employees to use in the course of business as a means to discuss tasks from projects to purchasing. And though the network itself won't be open to the outside world, the program that supports it will be. The mainstream media is struggling financially. Entertainment goes, but when it comes to information, we see big losses. At the same time, we observe the gain in popularity of the so-called non-professional media, blogs, specialized websites, freelance journalism, etc. We don't consume less information. This is not the cause of the corporate media losses. With the advent of the Internet people are actually more informed. This inverse correlation between the success of non-professional media and corporate media is not due to a change in demographics, or to a change in our need for information. We are actually seeing a shift of information consumers from the second category to the first. Why are people going for alternative media? The most important reasons are the quality of information and the trust invested in the information source. Some of us say that money and greed have destroyed the quality of professional journalism. On one side, revenue grows with the number of readers. Appealing to the greatest number means reducing the level of complexity, therefore, diminishing the quality of information. Moreover, going for what the majority likes means going for entertainment. On the other side, money comes from advertisement, and these media corporations couldn’t resist to turn almost every article into an infomercial. Others point to the loss of local content due to the conglomeration of the media and to the effort to render the business more efficient. The same article is now repeated in many publications that belong to the same conglomerate. These articles must be general in order to generate a local interest. Others see more than just the hunger for profits. Political motivations infiltrated the corporate media as it consolidated over the years. The general opinion at this moment is that the mainstream media is biased. People have lost confidence. The Iraq war was probably the most important event that made this fact obvious even to the most ardent believer. However, this is not the entire truth. People see the big media serving the business on one side, and the politics on the other side. We the people are in the middle. We are the source. The source of what? The source of everything! We produce the wealth. We maintain the elite to leave their lavish lives. And who’s the big media? Well, I guess they mingle within the same social circles with the politicians, the bankers, and the CEO-s. They are the same people! The big media doesn’t care about the quality of information. The scheme they’ve been pulling on us for so long is to make us pay THEM for our own indoctrination (which serves the political agenda), and for our own brainwashing for consumption (which serves the economical agenda). Their goal is disinformation, to make us politically impotent, efficient workers, and good consumers. The corporate media forms us! So what is the problem? Well, their scheme doesn’t work anymore. Their model is no more viable. They cannot form us and ask us to pay for it anymore, for the simple reason that an alternative to their service came into existence. Their scheme works only if they monopolize the production and the distribution of content. The Internet fucked-up their little game. How did this happen? People have the natural drive to express themselves. We are social beings. We like to tell others what we see, and what we experience. The Internet made this possible. At the beginning people expressed themselves through emails. Interesting stories were sometimes jumping viral from one person to another. You see, we also like to pass to others what we consider a good story. And then, the bandwidth increased and web2.0 arrived. This made it possible for individuals to express themselves in a more complex manner. As time went by, some individuals became good at reporting and analyzing information, and gained some reputation in the online world. They attracted more and more readers, and established themselves as a reliable source of information. They acquired real value, which was not granted by a piece of paper attesting their ability to discern truth from falsehood. These are the non-professional journalists. As the alternative arose, more and more disillusioned media consumers turned to alternative sources. Big media thought that the secret was to put their content online. They tried this, but it didn’t stop the bleeding. What should the professional media do in these circumstances? This question is discussed today in many forums, and I feel that most of the proposed solutions don’t address the real problem. Some put into question the future of professional journalism. Others criticize the quality of information produced by non-professionals, its segmentation, its radicalization, etc. There will always be a need for individuals properly trained for investigation and for discernment. But who is going to pay these people to do their job properly? Until now they were supported by the media industry, which is in trouble now. So the industry needs to restructure. However, the bloggers and the freelancers or the non-professional journalists with an established reputation are there to stay. The guy in Iran shooting a video in Tehran during the popular uprising and writing a few words on his blog is also important. Let’s not make the same mistakes as these people during the Renaissance that were criticizing the printed book for spreading content for pleasure and passion instead of for science, philosophy and theology; for being poorly written; or for spreading ideas against the church. The same explosion of information happened at that time, new genres of literature were created, some of them of bad taste, others that become classics. Despite all the criticism, the printed book flourished. The printing technology also made it possible to distribute time-sensitive content. The periodical was created. A newspaper at that time was like the blog of today, local people expressing contextual and timely information. In my opinion, new media organizations must be created that will work with the non-professional journalist, as well as with the guy in Tehran. The role of the journalist is to sort through all the content produced and distributed through all existing channels, verify the veracity of the information, dig more if necessary, and provide analysis. There will always be a market for good content, and the Internet today gives a tremendous opportunity to gather more information and to discover new leads. The Internet is a gold mine for a media organization, and it must be treated as such. Don't always expect to find chunky nuggets, you need to extract, purify, refine. But I have serious doubts that the elite can continue to employ the media to further their agenda, for the simple reason that they have no more control over the production and the distribution of information. Uploaded by bloody16. - Explore more music videos. What we are seeing in Iran, as in other parts of the world, is the genuine expression of the people for freedom, beyond political paradigms. Iranians know that Ahmadinagad stands against the USA and Israel, and they agree with this opposition, but they want things to be done differently. They want a better future, better economical conditions, as well as sovereignty as a nation. Considering the state of affairs at the international level, their actions seem somewhat irrational. They know that Iran is the primordial target of the USA and Israel for their plan of reconstruction of the Middle East and yet, at the same time, they go against their government, an outspoken regimes against their "enemies". Are the Iranians ready to give up their sovereignty for better economical conditions? I personally don't think so. We are witnessing at this moment a rising in consciousness at the global level, the realization that we the people can determine our own future. Moreover, we are starting to understand that governments all over the planet have lost their ability to contain the discontent of their masses, that they, the elite, are incapable to maintain their power because they are trapped into the old paradigm. We are like a wolf opening his eyes and smelling the wind, sensing a bleeding pray nearby. There is some irrationality too. It seems that people move to seize the power, to become self-determined but let the problems from the outside to be dealt with later. Irrationality is not strange in mass movements. It is actually part of the norm. What will happen to Iran if a weaker president comes to power? In this particular case I would say, nothing much… All major powers are facing the same internal troubles. The awakening is happening everywhere. The American government is most probably not celebrating watching the events in Tehran. They are taking notes on how to deal with this new breed of devastating popular movement. Russia and China are probably wrestling with the same problem. As long as things don’t get totally out of hand, as long as we contain our destructive military power, all societies have a chance to get on the path towards freedom. My response to the previous video: Is a division of snippers more effective than a coordinated crowd? Not so sure... Spreading fear by cowardly killing demonstrators from rooftops becomes an ineffective tactic if there really is a will for change. Having participated in a bloody revolution, I experienced first hand the tipping point where death becomes glorifying. I saw bare chested individuals affronting loaded guns. Fear tactics only work in favor of a tyrannical regime up to a certain point, beyond which they exert a negative effect, fueling the anger of the crowd. Forces of order are not prepared yet to fight well organized and coordinated masses, and I don't think that they will ever be able to catch up. Their resources are too limited to contain an informed and well coordinated mass movement, because they were not conceived for this sort of situations. With the help of the new technology the multitude can take a systems approach and coordinate attacks on the weak points of a tyrannical regime, undermining its support structures. 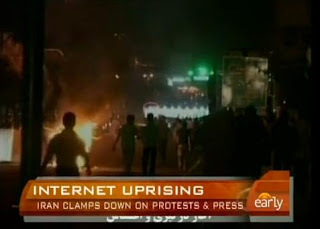 "Social networking sites were shut down in Iran after protesters used these sites to coordinate rallies and get news out about government action. Elizabeth Palmer reports." After the popular uprising in the Republic of Moldova on the 7th of April 2009 the government began a campaign of terror and human rights violations. In desperation Dorin Chirtoaca, the General Mayor of the Municipality of Chisinau, published a letter condemning these actions and appealing for help from the International community and the European parliament. With the letter, the City Hall of Chisinau is also publishing pictures of victimes of acts of violonce and torture. The letter was designed to touch the moral cord and to raise serious legal issues in terms of human rights violations. The strategy is to use the Internet to spread the message as whidelly as possible in order to force western institutions to act. 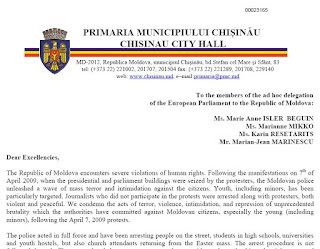 See the letter from City Hall of Chisinau here. "Students in Moldova are using Twitter as a tool to mobilize opposition against a communist victory in Moldovian elections. According to reports, close to 10,000 protesters gathered at Moldova’s parliament in Chisinau, Moldova’s capital and were able to eventually break through police lines to storm into the building. 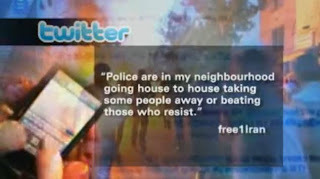 From looking at the tweets on the subject, it appears that the demonstration turned into a violent coup attempt." 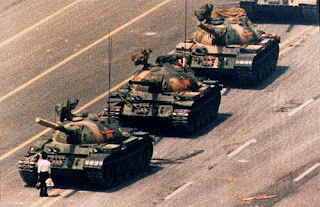 The Chinese government recognizes the potential of Internet technology and shots down social networking sites during the Tiananmen anniversary. virtual bank. Yes, the new technology can be used to control masses better than was possible before. however, short sightedness is a hereditary disease of modern corporations, and these people don't understand that the techniques they are developing will shortly turn against them. The future will be determined by the race between the tyrants and the multitude, how much potential they can actualize from the new technology. My bet is on the multitude.